Last weekend I had a bit of an urge for Riesling and opted for two very different expressions of the grape. I’ve waxed lyrical in the past about my love for Riesling and its inherent versatility (see my Spotlight Riesling post) and I think the two wines reviewed below perfectly demonstrate it. 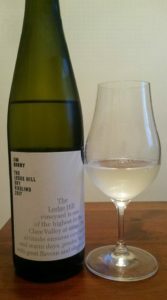 I took two wines – they were both 100% Riesling, they both came from the same country (Australia) and the same region (South Australia), zone (Mount Lofty Ranges) and even the same sub-region (Clare Valley). It could thus be reasonable to assume they tasted the same right?…Wrong! Deep lemon yellow in appearance, this was a blockbuster wine on the nose – a real assault on the senses: a mix of kerosene with lime, peach and white flowers…I know it sounds strange but it was really appealing! On the palate the wine was medium-dry (by which I mean you can definitely taste some sweetness), low in alcohol (less than 11%) and asurprisingly weighty body – a lot of this comes from the residual sugar but also from the fermentation techniques (see note below). The flavour profile mimicked the nose with dominant flavours being peach, lime and the unmistakable waft of kerosene. The wine had a lovely balance of residual sugar and acidity so it retained a surprising freshness. I really liked this one, very gluggable indeed and perfect with spicy Asian dishes. I bought this as a bin end for £9.99 (down from £14.99) from New Forest Wines, get some while stocks last! So there you have it, two Clare Valley Rieslings, both thoroughly enjoyable but very different. So what caused such differences? Age has clearly played a bit part: Riesling from Clare Valley is known for developing kerosene/petrol notes whilst relatively young and the Monster Attack is from 2014 hence the more developed aromas. If you like this style look for slightly older wines from this region. Fermentation techniques: Jim Barry’s Riesling has been fermented to dryness whereas Monster Attack has retained around 24g/l of residual sugar so has a very distinct sweetness on the nose and palate. The fact that Monster Attack also had 15% of the wine fermented in oak has also given this wine more texture and body than you would usually expect from a Riesling. More and more producers these days do stipulate on the label if a wine has some sweetness so as to avoid consumers suffering a sudden shock to the senses, but as a rule of thumb, if you want a sweeter style and it isn’t clear on the label, look for the alcohol level, the lower the ABV the greater the likelihood there will be some retained sugar. That said, there is always the contradiction that disproves the rule and it may just be that it was a very cool harvest and the grapes didn’t ripen to give high enough sugar levels leaving a dry, low(ish) alcohol wine! But I digress as in reality this is unlikely to be a factor with Aussie wines! I’ll leave you with a final thought – don’t automatically assume you won’t like the medium-dry style of Riesling – the grape usually retains enough acidity to retain a real lightness and freshness which really does work perfectly with spicy food, so if that rocks your boat don’t be afraid to give it a go.